Thank you all, you dear, sweet, friends for your encouraging responses to my grumpy post! Thank you too for your prayers about the fair. First off - NO RAIN on fair day! As you can tell from the photos is was mostly cloudy - the sun did come out a bit and we were thankful for my mom and dad's big umbrellas. We always sit at the top of the bleachers where there is a fence behind us so we can rest our backs, the added benefits of being able to use the umbrellas, and not blocking any one's view! Kyle and my Dad did the open lead line event. It is for kids 8 and under. Last year he got a 6th place ribbon. This year a 5th! He was excited! 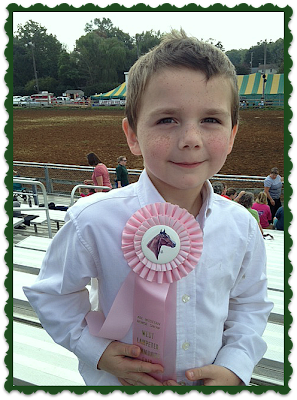 He has one more year in this event, so he says that hopefully he'll get a 4th place ribbon next year! Emma was in the store so I texted her a photo...she said "They obviously couldn't see his precious freckles!" She loves this boy! We had a good school day though, and I am enjoying our study of the animals that live in the ocean. We are studying toothed whales right now. It was delicious, and easy. Oh and I didn't have rosemary so I obviously left it out, and I am thinking you could substitute other herbs and it would still taste great! In the evenings, I like to change the mood of our house, to quiet things a bit and help everyone begin to relax. I rarely use over head lighting anyway, but in the evenings I never do - unless there are games being played. I like to turn end table lamps on, have my accent lighting on, and light my candles and oil lamps. It makes the sink area an appealing space. The atmosphere becomes relaxed - last night we were watching a tv series online - not sure if we are going to like it or not but the premise is intriguing. One day the power is on, the next is it off, for over 15 years. But it seems as if the situation was man made and could be reversed. I love making my home a warm, relaxing place for my family. A place to gather after our busy, work filled days, to provide a place of shelter, a place where they have the security of knowing that they are loved and delighted in and wanted. It has nothing to do with money actually. It is all about God's grace to me - His extravagant grace. My grandma was a woman who felt that she wasn't 'good' enough - she didn't deserve to sit in a beautiful hotel lobby because that place "wasn't for people like us." That thinking always made me sad, because she was thinking that worth was tied into how much money she had. 2. He placed me in a loving family. 3. He united me with my wonderful husband. 4. He made me the blessed mother of children, now a grandma too. 5. He has used difficult things in my life to cause me to grow in grace. 6. He has provided our wonderful home. "Come said the wind to the leaves one day, Come o're the meadows and we will play. Put on your dresses scarlet and gold, For summer is gone and the days grow cold." A Children's Song of the 1880's One of my Red Sunset Maple trees a few years ago! Summer is at it's end, and gladly I bid it farewell! While I will miss the wild fullness of the plants that grow in my garden, I also really enjoy cutting back the garden and putting it to rest for another season. The birdbath is full from the rains, and with the feeder not far away, hanging in the maple tree, the birds will still hang around. I like capturing my cottage garden in photos. This garden may not be here next year if my parents house sells and they add on. This area will become part of a porch. Seasons change and so do our gardens, our houses, our lives. I am glad to walk with my Lord and trust my life to Him. I had been in a rut of being at the mercy of a schedule, not of my own making. My days consisted of driving people to work and picking them up all at different times, usually the last pick up is between 9:45pm and 11:00pm. In between I was squeezing in school work with the kids, and cooking and trying to keep the house clean. Oh, and yeah, I run a business, too. Can you say crazy exhausted? So on Monday I just had to get out of the house! We did school work and then Rachel, Emily and I went shopping with my Mom. It was so much fun! We are having fun with Vee's monthly Note Card Party! This month I want to bid farewell to summer! I am showing flowers that bloom in my garden all summer long, but now are done for the year and at rest. Farewell, glorious Peony! Such beauty and a delightful scent! See you next May! Farewell to my Zephrine Drouhin rose. This rose has become diseased and will be leaving my garden. I love it though and will likely find a place for a new one! Farewell, delightful hydrangea. You've brought me great joy! Farewell, Daisy! You are a trooper in my garden! If you want to join in the fun of the Note Card Party just follow the link above! This video was taken a few days ago, but this is seriously what our days have been like. Glorious September weather! We don't always have such great weather in September, sometimes we are still cookin' in the upper 80's and 90's. Our local fair is at the end of September and during the equine events on Friday we have gotten sunburn or used an umbrella until the sun set! I've learned to look for blessings from the Lord and to point them out to the kids and to express thankfulness! "Oh, Mothers of young children. I bow before you in reverence. I think I just haven't given myself the time to read. I have a fairly busy schedule and when I have some free time I hop on the computer instead of picking up a book. I have a pile of reading I want to do, now I just need to discipline myself to do it! I usually have several books going at the same time. What kinds of books do you read? Are you ever reading more than one at a time? What are you reading these days? Thought I would show you my Autumn decor. This is the view from kitchen counters - I am standing on the countertop. I love this space above the cabinets. Isn't the plate nice? I love the color. Want to know a secret? It's a paper plate! Rachel did the whole space over the cabinets and I think she did a great job! I have just a bit of decor on the piano...I love the red popcorn. The light is not good in the hallway but I wanted to show you this wreath hanging. Sarah has her raincoat here and it looks like her shoes are there too! The yarn in the basket makes me happy. Emily and I have begun knitting again! I have a lot of stuff rolling around in this brain of mine, but nothing cohesive, so I decided to post a bit of this and that. This morning I have been listening to The Bankester's on AirPlay Direct.I really enjoy the sisters harmony - and the acapella "Desert Lullaby" is very good! It was interesting talking with Rachel, Sarah and Kyle about 9/11. Rachel was only two and doesn't remember, Sarah and Kyle weren't born yet. I want them to know about this horrible day in our history, for I fear one day someone will try to say that it never happened. Some of the history of that day is already being revised. Fellowship is on the agenda for today! The weather is delightful out - cool! - and the high today is going to be 73 degrees! I am going to drink it all in, and savor the beginning of the Autumn season! All photos from years past. No color here yet! For several years now I have been increasingly concerned with the economy and fuel and food prices. I heard this summer that over the last four years Americans have lost 40% of their wealth, due to increased taxes, the devaluing of the dollar and the loss of property values. 40 percent! Good thing we had been taking steps toward a more simple life. For most of my married life, I have cooked from scratch. When I was in missions training I learned how to make white sauce as a basis for cream soups, how to can, how to live simply. I loved it, thought it was not always convenient. A few years ago I told Tim I wanted to have a vegetable garden and grow more than tomatoes. I wanted the girls to be comfortable gardening too, and I wanted them to know those skills that my great grandma was very comfortable with! So we began with some raised beds. We also got some chickens. We have learned a lot.